Step #1: Download and install the free command line .rar extractor. 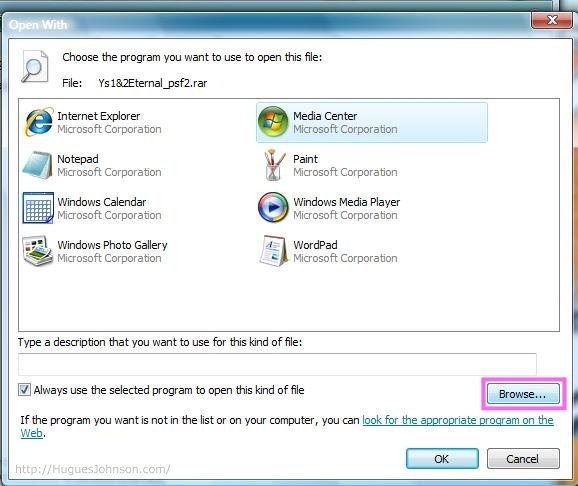 Jump over to https://www.rarlab.com/rar_add.htm (link opens in new window) and look for something called "UnRAR for Windows". Download and install it. It will default the installation folder to "C:\Program Files\UnRar\". Step #2: Right-click on a .rar file and select "Open". This only works if you don't already have an application registered to handle .rar files. Step #3: You should receive a message about not being able to open the file. 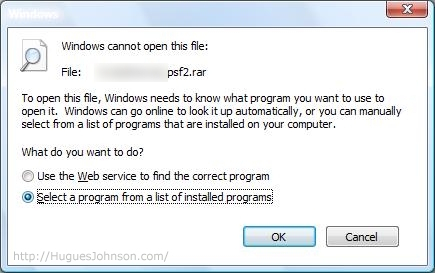 Choose "Select a program from a list of installed programs" and hit "OK". Step #4: Click the "Browse" button on the next dialog. Step #5: Navigate to the folder where UnRAR was installed ("C:\Program Files\UnRar\" unless you chose something different). Step #6: OK, this isn't really a step so much as a rant.. At this point UnRAR.exe is associated with .rar files, that's good. However UnRAR.exe takes an additional command-line argument that you need to set in the Folder Options, that's bad. In Windows 2000/XP you can go into the Folder Options and set this in about 5 seconds. In Vista they decided to either remove or completely hide this option. Even running Folder Options as an administrator doesn't show it. Step #7: So instead of getting a convenient dialog, you now have to take the much riskier approach of manually editing the registry. I suppose you can accidentally do some bad stuff in the old 2000/XP Folder Options dialog.. but it's nothing compared to what you can do in the registry. Anyway, you can try setting the shell options for UnRAR.exe but that appears to do nothing. Step #9: Try opening the .rar file again and you should get a nice old-school dialog now.